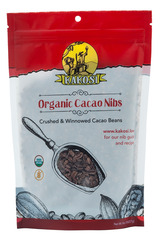 A true super-food gift from nature, cacao nibs are gently crushed cacao beans. A true super-food gift from nature, cacao nibs are gently crushed cacao beans. These pieces are packed with antioxidants, magnesium and iron. Cacao nibs are enjoyed in a variety of foods. This addition makes whatever you're eating, super-food enhanced.